The American Cart Heavy Duty Trailer Dolly is built from the ground up with quality components and attention to detail. Starting with the 10″ Amerityre Closed Cell Foam Wheels, the cart is ready to go at all times. No worries or frustrations about flat ties. The foam tires also cushion the load and provides smooth maneuverability. The all-steel construction ensures quality that will last. The base is formed from 1-1/2″ tubular steel, it is then reinforced welded to provide the sturdiest base on the market. The engineering, welding, and powder-coating are all done in house at the Ohio Plant to ensure quality control all the way through. The trailer dolly comes standard with a 2 inch ball, but that ball is interchangeable based on application. The dolly can also be used with a pintle hitch. Easily move utility, boat, cargo, jet-ski and other trailers. You suggest you hope I am ecstatic with my purchase. I am very happy with it. 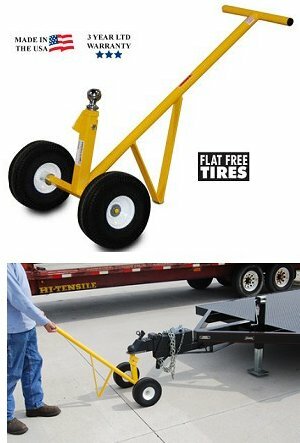 Great for moving boat trailers and small single axle cargo trailers. I don't know how I didn't get this sooner. Using it to maneuver my 12' utility trailer is a breeze now. I have even used it to move my 18' flat deck car hauler around. This is a much better way than trying to drag things around by hand. Money well spent. This is an excellent dolly that easily does the job it is rated for. I looked around for a trailer dolly for a while before settling on this one. I saw cheaper ones but, after analysis of the reviews, realized that they would break under some scenarios. So I spent the extra money and bought this one based on the strong reviews. This dolly is rock solid in all aspects of the build. It has not bent or broken when I made too sharp of a turn. I use it to bring my trailer from the front to the backyard across grass with a waverunner on it and the wheels turn with minimal friction. My neighbour is really impressed with it and wants to borrow it for monving his boat trailer around. In summary, an absolutely solid trailer with excellent value for the money. We like it but it is much smaller in person than it shows online. Needs bigger tires and the handle could be a little longer. Moves my boat across driveway into garage just like I wanted. Well built, easy to use. Use getting my boat out of storage and works great!!! Dolly is well made, performed as described on the website. I,m happy with this dolly, it is very strong. This Trailer Dolly is exactly what I was hoping for. It is heavy duty with more than enough ball height adjustability than I actually needed. The dolly is made of strong and heavy materials ensuring no threat of buckling during use. The two wheels are spaced apart allowing for more stability. This is not a light duty Trailer Dolly. Thank you for selling a quality product. I compared many trailor dollies originally looking for the least cost. Don't do it. Chinese made dollies are poor quality, this one is the real deal, and will out last me for sure. I have a 20.5 ft Mastercraft ski boat. Needed a way to maneuver a sharp turn and park in the garage. Heavy boat and this tool does the job easily. Adjustable ball height allows me to get the tonge up high and put more weight on the wheels. Love the composite tires, no flats. well worth a couple extra bucks for a quality American made product. Very heavy duty. Can't imagine it ever breaking. Used it this past weekend for the first time to move my trailer 16' Scamp Piece of cake. Not inexpensive but a quality product. Sturdy and reliable. We move a 3,000 lb. boat and trailer with no trouble. Tongue weight is at least 250 lbs. and the dolly handles it. This really helps me move my log splitter around. I bought the unit with solid wheels. Perhaps I should have gotten the pneumatic tires instead. Little difficult on short radius turns, but otherwise a great unit! I would recommend this unit. Heavy duty. Better than some tool distributors units. Comes with 2 hitch ball. Great! My chinese dolly was stolen, so this time I was going to get the best dolly regardless of price. I googled best trailer dolly, this dolly came up and I am more than satisfied. I would never buy any other dolly. This is not a fake review, I just really like getting tools that work like they should. Purchased the Heavy Duty Trailer Dolly to move a 2,000 lb. boat. It went together very easily and is far more robust than others I have seen. That it is made in the USA is a big bonus. Would highly reccomend this dolly. This Trailer Dolly works great. Assembly was easy and it is truly Heavy Duty compared to others I have seen. The adjustable ball is a must when you have different trailers to move. Worked as advertised, just what I needed. By far the best trailer dolly I have used. I have broke the handle on two other types,but you will not break this one.I pull a 7x14 inclosed trailer and 7x12 open trailer with a riding mower loaded on it with ease. This made in the USA trailer dolly is as good as they come. I was initially concerned about lack of support bracket between ball post and handle, but it is built so stout there is no need. I use the dolly for my 18.5' I/O bowrider, and the dolly handles it easily. Also, it will be great in the future, not having to worry about inflating tires. 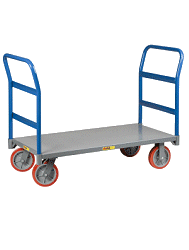 I always believe in buying the best, and this trailer dolly certainly is the best! Excellent heavy duty product and great to move my Bass Boat around and easily maneuver it in an confined area. Works well for moving the trailer. Light, yet strong. Would be nice if the wheels were spread a little further apart for some added stability. I bought the trailer dolly to move my new 2000lb boat in and out of the garage for it's weekly engine run and to manuever the boat around my circlular driveway. The dolly makes these tasks so much easier than hooking my boat trailer to my truck. It helps heighten my whole boating experience. Because of the weight of the boat I do need the help of one of my sons to get the boat moving, but once it's moving the dolly makes it easy to manuever. It's a great tool. My new trailer dolly has made it much easier to move my Teardrop camper. I no longer have to maneuver it while it is hooked to my truck. I can easily place my camper in any campsite it will fit in.